Tomaso) so you came over and built a car for Bill Simpson, he’s a pretty interesting character; what was it like working for him and what type of car did you build? Steve Roby: I put together a ‘74 (AAR) Eagle, with direction from Mike Devin, for Bill (Simpson) to drive at Indy. Bill is a good guy; excitable, but with a heart of gold. His products have saved many lives and he was definitely not due the hassle that he received from NASCAR. Bill thinks about improving his product from the safety perspective all the time, not from the perspective of making money. I think I must be one of the few people who formerly worked for Bill, who are still good friends with him… He is pretty sharp business and talent wise. Although Roger (Penske) seems to get all the credit for discovering Rick Mears; it was actually Bill who first discovered him, as we ran Rick in 1976 as a second car to Bill at the Ontario Motor Speedway. T) From Simpson you landed at the McLaren Indy Car Team; how did that come about? SR: When Bill did not qualify for Indy in 1976, I worked that race for McLaren and they won. From that they offered me a position for 1977. T) As you know, I wasn’t heavily into Indy Cars way back in the day. As I’m assuming you worked with Teddy Mayer, Tyler Alexander, etc. Where was the McLaren Indy Car Operation based at, and what can you tell me about the aforementioned “Head’s” of the Organisation? Tyler (Alexander) ran the North American side of the business and Teddy (Mayer) ran the Formula 1 side. In North America we had the Indy Team and we had a new BMW IMSA operation which developed the turbo engine for IMSA, this engine ultimately became the BMW turbo F1 engine. Roger Bailey ran the BMW operation with Wiley McCoy developing the engines. David Hobbs drove the IMSA BMW Turbo Car and Rutherford drove the Indy Car. T) As a Chief Mechanic you’re responsible for the preparation of the whole car? What does this entail (briefly) and how many crew members did you typically oversee? SR: I was Chief on one car and Phil Sharp was chief on the other. Each car had another mechanic and we had one general purpose fabricator and a truck driver. We planned to alternate cars but it often worked out that one car was predominantly a short track car and one was a long track car, but at each race they were in the same spec; one the race car and one the back up. When you crash on an oval there often is not much one can do at the track to fix the car so a spare, ready to run chassis, with hopefully the right engine in it is a must. The entire team was five guys plus Tyler. For races we had one engine shop person and some weekend warriors as it took eight people to race the car. I would say the best description was that we collaborated on most things. Tyler, Phil and I made all the decisions. Physically on the car, the Chief Mechanic was responsible for building the gearbox and rear end and for being at the Dyno when the engine was run. The engines were quite different track to track. At the track the chief (mechanic) was responsible for all the activity. Interestingly, in the off season, Phil and I built exhaust manifolds, I built and developed wastegates and Tyler built the inlet manifolds. Phil would often go back to Colnbrook (McLaren’s HQ) to help build new chassis. T) So you were Chief Mechanic at McLaren’s Indy Car Team when Johnny Rutherford was there? SR: I ran J.R. (Johnny Rutherford) at McLaren from 1977 ‘til 1979, but I was not crew chief in 1976 when McLaren won the Indy 500. T) Did you enjoy your time working at McLaren and Chaparral running “Lone Star J.R.?” As I’m assuming Rutherford was a good driver to work with. SR: Yes. One really great thing about Team McLaren was that it was really a team… We worked, lived and traveled together and pretty much lived by the rule that you either got on with one another or you left. It was a team effort, there were no Superstars; J.R. fit that ideal like a glove. He was part of the team. He gave his all and Betty (his wife) always had him ready to race when they rolled in. He was tough and brave, as I remember one time he broke four ribs in an accident in Texas and he could only get in the car very gingerly. We kept his condition pretty quiet and resolved to just get to the end of the next race (Trenton) in one piece. Towards the end of that race, obviously in some pain; as he was pretty quiet on the radio, he asked what position we were in and who was next? Once we told him the car, which he could see in front of him was a place ahead; he sped up and passed that car to finish third or fourth… A really gutsy effort! Most drivers need to be managed pretty tightly and from some perspectives he was no different from the others, but he was definitely a team player. He, along with Tom Sneva and Rick Mears liked a racecar that’s a bit loose which was the trick on short ovals like Milwaukee. J.R. was hell on wheels at those short tracks; some years we won both races at Milwaukee and Phoenix. It takes a spot-on set up at all stages of the race, but it also takes a driver who can press on and keep the tyres working at all stages, keep the stagger up for the entire race and he was really good at that. He was so good at Milwaukee that he passed Bobby (Unser) and won on about 6 1/2 cylinders one year. The tube, which seals the spark plug hole in the head has a water jacket on the outside and the plug wire on the inside, split and was spraying water on the plug which was making it short out and the engine misfire so we were way down on power and were expecting the lump to let go at any time. We still won! On big tracks, although he had a reputation as a crasher he was exceptional. I don’t think we ever crashed at Indy or Ontario and only once at Pocono on the bump over the turn 2 tunnel. We went through a tough time at McLaren on road courses as John has a right arm which is fixed in one position (the result of a big sprint car crash), which did not make road racing that easy for him. He could not accept being slow so he would revert to going really deep under braking whenever he had to find some speed which often got himself into trouble. I think we crashed at nearly every track for every road race but did manage to finish most races in reasonable condition. “Slow in - fast out” was our mantra and it took a few fraught practices to get that protocol through his head. He developed enough as a road racer, with a lot of help from Jim Hall, that we won a wet race at mid-Ohio which was really quite an achievement. T) What was it like working for Jim Hall and how did the Texan’s Team compare vs. McLaren? SR: At Chaparral my responsibilities were much greater. I was responsible for hiring and firing, the technical development of the car, the design of the car, hotel booking, budgets etc. I actually did not see much of Jim. He was at the shop only a few hours in the morning and a few hours in the afternoon. Jim looked after sponsorship and finance and some of the tactics and strategies in the races. Jim was really helpful on the design side and he would come around after his dinner when I was doing design work and discuss various aspects of the development I was working on. There is no book to tell you what to do so we would discuss design strategies at a 20 foot long drawing board, agree and then I would execute. His basic focus was that until you were flat all the way around a track you did not have enough downforce. We tried some way out stuff and tested the ideas on the race track we had out back. If they worked then we made real parts and ran them at the track. I can see why they did not finish many races in Can Am. He loved to try new ideas and parts but never wanted to develop them to be reliable. My cars were always pretty reliable so we probably complemented each other well. That was another physically tough deal. I would go in early in the morning to talk to England because of the time difference, do my Crew Chief and car prep management work during the day and then do design work at night. I actually worked myself to a standstill at Chaparral. At one point I could not get out of bed I was so used up! I did have a great bunch of guys at Chaparral. Bernie Ferri, with whom I had worked at Surtees, ran one car with a new guy I had plucked out of a bagging job at a supermarket, John Tzouanakis, (whose brother Mike worked for Penske). Tom Anderson, who I knew from his Hogan days with help from the others, worked the spare car. Dennis Swan stayed with the team from the previous group and did the Gearboxes and Fab work. We hired Eloiza Garza from shooting a chopper gun making pickup truck canopies, and taught her to do carbon work so she ran the “gup shop”. (Gup is what Jim Hall called the resin/fiberglass shop; SR) Mike Fanning and Gerald Davis did the engines; a very focused group. Although I made all the molds and some parts, at the track the guys would rightly not let me work on the car. They did a really good, focused, job as can be seen by the reliability record. What has provided me with pleasure is what these guys did after Chaparral: Bernie went back to Australia to rear sheep, while Dennis, Tom and John now have a lot of Indy wins and leadership of teams under their belts so we must have been doing something correctly on the people side. T) Was it a whole new ballgame working upon a Ground Effects chassis? SR: That is an interesting question as it was still just a race car, but it just developed huge downforce numbers. We were at the beginning of the understanding of the ground effects phenomenon. What it meant to us was that whereas a McLaren M24 has a nose, cockpit surround and engine cover for bodywork and the rest was tub, the Chaparral had a basically hidden tub and sports car levels of bodywork, both on top and underneath the car. The chassis had to support the bodywork-derived aero loads and still perform functions in common with older cars. The amount of heat generated by a turbocharged engine was not an insignificant problem in a car with fully enclosed bodywork. The gearbox had as big a cooler as did the engine when I arrived in Texas! We took a slightly different route than other teams in that we developed wet lay-up carbon fiber bodywork for both top and bottom sides of the car, all done in-house. That is no small order when one considers a car which is 15 feet long. Our carbon fiber tunnels went as far as the leading edge of the rear wing. Other teams had Aluminum tunnels which terminated in front of the rear wheels. We believe we had more downforce and less drag than did our competitors. When I first got to the car there were grooves in the tunnels which had to be caused by the tunnels sucking down on the road, unbeknownst to the team. We strengthened the tunnels and started work, with improvement coming in big chunks. This period was before personal computers were common so we had a paper roll device with two push-pull morse cables connected to the suspension. These would mark the paper roll with a pencil lead, showing the ride height. From that crude Chaparral developed (before my time) device we could ascertain downforce levels. We had a two mile track in the scrub behind the shop and Bernie would drive the car out there with the rattlesnakes to generate data for each development. The aerodynamic development path we took was different from that taken by other teams both in F1 and in Indy Car in that our tunnels went right to the leading edge of the rear wing, and we worked at maintaining the center of pressure position by not loading the tunnels as much as other designs but maintaining the loading under most conditions. T) And do you consider 1980 to be your most successful season as a Chief Mechanic? Since after all JR won five races that year enroute to his lone CART title. SR: For sure. The team was a bit of a disaster when I arrived so I had to build pretty much a new team and get to understand a new car and a new technology. What I appreciated the most was that the guys were very focused on maintaining the car so I could work on development. They (with J.R.) did such a good job that until we crashed 10 laps from the end in Mexico we had completed every single lap of every race, and a lot in the lead. That was an astonishing feat considering the engine troubles that we often had in practice. 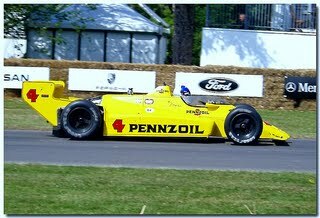 In fact we, the team, did not even know that until Deke Houlgate, the Pennzoil PR guy told us. We had a protocol of something new on the car for every race and the guys kept most of that work away from prying eyes with a lot of mis-direction. Some of the things worked and some did not. The point was that we continued to develop a faster and faster car, while helping reliability all the time. T) How fun was it being in Victory Lane at the Speedway in 1980 as the winning Chief Mechanic. SR: I don’t know that it was fun. Somewhere I have a photo of me, sitting on the pit wall, with my head in my hands with relief that we did it. We knew that if nothing went wrong we would win. Nothing going wrong is a few words for a very difficult task, as we were really focused in 1980 at Indy. We only ran in the heat of the day and were fastest for all but one day when Tim Richmond did a happy hour run in the cool of the evening. But it was not at all as smooth as it looked; as I actually built a set of large diameter headers in the truck during the first week of practice to use just for qualifying. On the morning of qualifying we had a magneto fire which trashed the top of the engine in the primary car so we had to qualify the back-up, but we still got it on Pole (without the headers). The guys were so focused on getting the car home that they came to me and asked that we not do the Pit-stop competition so they could maintain their focus on finishing the race. That was money in their pocket and a lot of sponsorship coverage but we agreed to do so. T) Any funny stories you’d like to share about Lone Star J.R.
SR: There are a lot that I probably should not tell. But there is a common laugh that we have together. At the Ontario Motor Speedway the trophy for the Ontario 500 Pole position is a really neat copper and brass1909 Reo Coca Cola delivery truck. It stands about ten inches high and about sixteen inches long. We were on pole for both races (Short and the 500) in 1977 so J.R. promised me that the next time we were on pole at OMS the trophy would be mine. John was very good on the radio as befits someone who grew up around aircraft (His father was an Air Force mechanic) and piloted his own P51 Mustang. We could talk to him anywhere on the track whereas with some drivers you dare not talk while they are in a corner. We were testing at Phoenix with the Chaparral and in my ear I hear “Damn-it!” We hear the car hit the wall, ” Damn-it, we broke a driveshaft” as the car rides the wall down past us in the pits; he is talking to us like a true fighter pilot in the right stuff as the car is dragging down the wall in front of us. T) Did you get to see Rutherford driving the “Yellow Submarine” at Indy when he took it out for a few ceremonial laps recently? T) Did you enjoy your time as Chairman of the Louis Schwitzer Award and what did you do as Chairman? SR: Yes it was fun. As Chairman I organized the members into a committee, chased the sponsorship money, organized how the voting would take place, vetted and edited the individual reports from the interviews with the LSA (Louis Schwitzer Award) potential winners so that when the winner was selected the write-ups would be ready the next day. The time line from voting for the winner to the press release is pretty tight so a lot of pre-work has to be done to ensure that the final releases are factually correct and appropriately written. T) Did you have a favourite recipient of the prestigious award? SR: As the Chairman I had to remain unbiased. I did ensure that the applicants’ stories were factual which took some effort. Sometimes the committee pick was not the pick I would have made but that’s life. T) And do you follow the Indy Car Series today? And if so, how does it stack up against the time you were involved in it? SR: From discussions with people who work on IRL teams now I am repeatedly told that I would not like it now. I really enjoyed the car and engine development aspect and they cannot do any car or engine development now. Personally I think it is too safe and too easy. In my day drivers were killed almost regularly and although I am not saying I want to see drivers killed, I want to see the drivers have more respect for each other. In my day the drivers tried really hard to not hit each other as the results of wheel contact were never good, now the majority of the drivers do not seem to care if they touch one another. As for too easy, I would like to see a situation in which the drivers have to lift for corner entry. Whether that is done with less downforce, or more power I cannot say but it is a lot more difficult to apply the power once one has lifted than it is to keep your foot down and hope to make it. In my day there were sometimes some pretty weak fields also but the guys at the sharp end were separated from the lesser drivers by more margin and that margin was caused by the driver waiting until he was confident enough to put power to the rear wheels off a corner. T) As for drivers, do you like Ryan Briscoe, Will Power or Scott Dixon better? SR: I don’t know any of them that well although I have spoken to them all. I like that Briscoe seems to have calmed down a bit and it shows in his results. Most really good drivers need affirm hand guiding them and Roger seems to be doing a good job in that aspect. Dixon is to me like Prost… Doesn’t do too much stupid stuff early in the race and is there running strongly when it counts. Will seems to be very intense and quite quick, still a bit mistake prone but that will smooth out in time. T) And besides leaving out Machinists Union & Mayer Racing, is there anything else you’d like to say? SR: The less said about the IAM the better. Never have I worked with such divisive management in my life. The only highlights of that episode were the social interactions with Ed Pink, the engine builder and Roger Mears and their wives. The highlight for me was getting Howdy Holmes onto the Front row. We really should have been on pole but he forgot to turn up the boost during qualification. Never the less we had Tom Sneva on pole. Yet once again there was tumult under the perceived calm. As the fast 1984 Marches had very serious wheel bearing problems as we went faster than the car was designed to go (or they made a design error) and the night before the race both of our cars and both of Penske’s cars were sitting on stands with no axles in them as we figured out what to do. We ran each car a little differently and only Mears and Howdy made it home. Rick (Mears) luckily won with balls missing out of his right rear wheel bearing. Howdy, who likes a pushing car, had damage in his right front bearing, and Tom (Sneva), who drives his car loose, lost the bearings in his right rear challenging for the lead with about 20 laps to go – the difference between understeer and oversteer!